Technology is creeping into the bathroom too – but it’s being used to amp up the indulgence factor. Crucially, though, the emergent trends are inspirational in their diversity, giving us plenty of fresh, fun new materials, colours and products to experiment with. Here, five design experts highlight the 10 key bathroom trends they’re most excited about. Our reflections have never been so beautiful. “The traditional shaving cabinet is becoming a thing of the past, as designers transform the bathroom mirror into a work of art and make it the new focal point of the space,” says Kate Connors, interior designer and owner of Kate Connors Interiors. Scandi-inspired round styles set back in finely honed frames lead the way. We’re also seeing a growing number of timber-framed mirrors recessed into the wall above the vanity, featuring an integrated open shelf. Recessed mirrors deliver an elegant, streamlined aesthetic, particularly when finished with a strategic combination of task and feature lighting. Connors suggests decorative sconce lights or LED backlighting. Lighting has become an important factor in bathroom design, largely thanks to the emergence of LED technology. Instead of a single overhead light, lighting is layered throughout the room to create ambience, define the various task zones, and highlight interesting details. Think motion-sensor lights installed at floor level, and glowing LED strips concealed within decorative wall niches or tucked under joinery. Or go all-out with smartphone-controlled coloured mood lighting. Add a splash of personality to the bathroom with a decorative, strategically placed pendant (or three). For maximum impact and to create soft, flattering lighting around the vanity, hang a set of bulb-style pendants at eye level. Or bling things up a little with an oversized lampshade or chandelier. 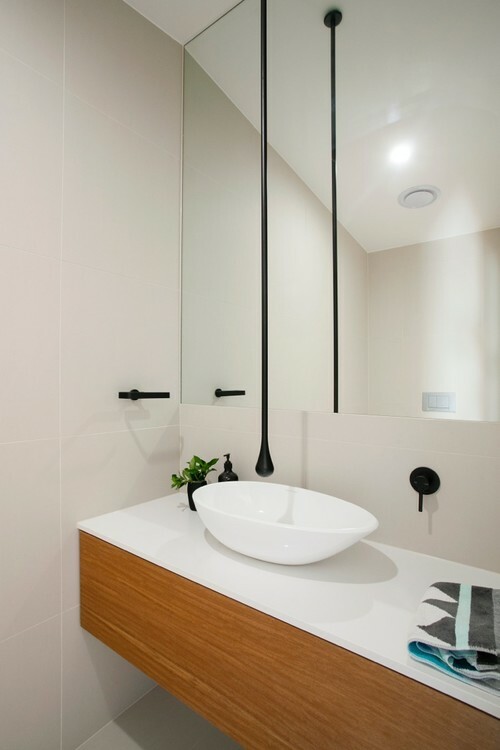 Tip: When selecting a light fitting for your bathroom, make sure it is sufficiently rated and compliant with Australian Standards. For bathrooms, always choose If you’re pulling together a bathroom on a budget, a decorative, finely sculpted vessel basin is worth splashing out on as it can instantly elevate the room. For even more impact, dress the basin up with a dramatic tap. Here, an elegant, egg-shaped basin adds softness and organic appeal to a pared-back room scheme, while a show-stopping tap introduces drama. water-resistant light fittings that can withstand exposure to steam and moisture, and ensure they’re hung well away from direct contact with water. Hiding everything away in cupboards is so 2017. This year, we’ll be putting our collectibles – and our personalities – on show by including some display shelving in the mirror surround or vanity unit. Put your individual style on display with baskets, towels, pretty planter pots and ornamental bottles. The key to making this look work? Keeping things tidy and not over-filling the storage nooks. Open shelves create a feeling of lightness and space within the bathroom. 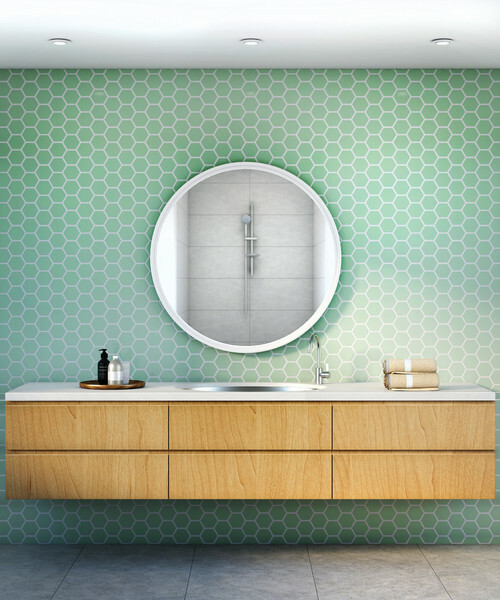 Aligned with this trend is the growing preference for custom-designed, wall-mounted or floating vanities. Do away with handles and drawer pulls, allowing the materials and finishes to take centre stage – be that timber or honed stone (the real thing or ceramic lookalikes). 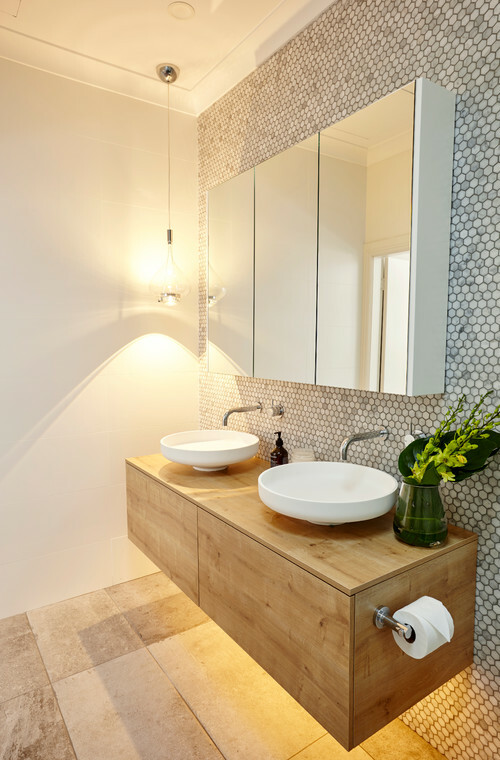 The minimalist aesthetic of a floating vanity is also practical – it frees up floorspace and makes cleaning a breeze. We’re talking smart, sensor-activated toilets with self-cleaning functionality, seat warmers or night-lights, such as the Roca In-Wash Inspira Smart Toilet pictured above, and high-tech showerheads with customisable spray settings. Other ingenious bathroom products designed to take indulgence to the next level include touchscreen mirrors with integrated speakers and USB ports so you can tune in while you’re zoning out in the bath. There are also electronic mirrors with LED clocks, and magnifying mirrors with automatic de-misting functionality. Santilli and Zorlu report that the day-spa trend, driven by our collective focus on wellness of body and soul, continues to gain traction into 2018. “Stylists and designers are trying to recreate the vibe of a resort oasis in the bathroom,” says Zorlu. Santilli describes the day-spa-inspired bathroom as a “personal retreat with a touch of indulgence – a true place of escape”. 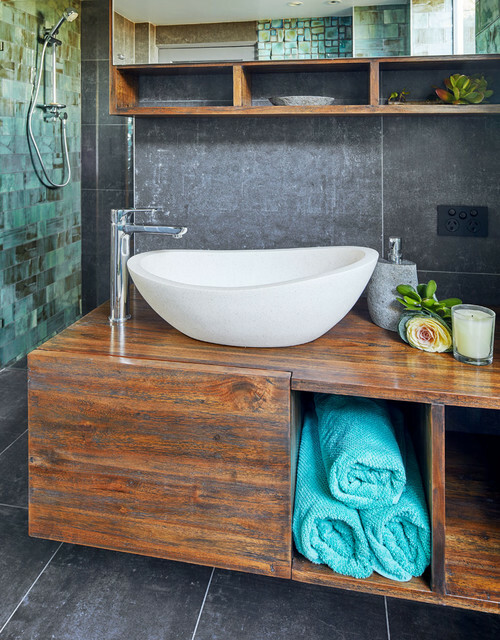 While this look can play out in two ways – earthy and organic or high-end glamour – Zorlu says that resort styling pivots around the bathtub: nothing says luxe like an oversized freestanding tub. Create a serene atmosphere with large-format, floor-to-ceiling tiling created from tactile materials such as stone, honed concrete and timber. 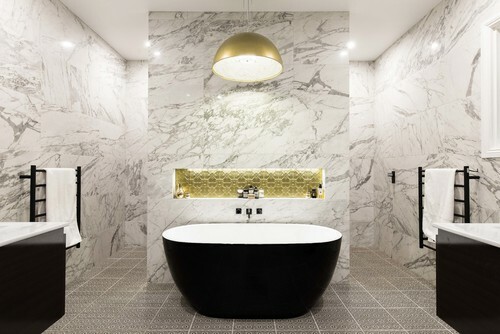 The designer of this bathroom has captured the lavish opulence of a five-star hotel perfectly. Recreate the look with a cool, crisp colour palette, upscale tapware and a dramatic, oversized pendant light. If you’ve got limited floor space, remember that convenience translates as luxury too: inclusions such as a rain showerhead, underfloor heating, and heated towel rails will take the bathing experience from banal to beautiful. And don’t forget to include a spot to hang your clothes and a few scented candles. Nordic styling revolves around bleached blond timbers, modular joinery, and lashings of natural light. If the look is too plain for your tastes, introduce a 2018 twist with a patterned tile on the floor or wall. Retain the visual economy with streamlined fixtures and fittings, under-mounted basins, and a crisp, pastel colour palette. We’re tapping into metallics in a big way in 2018, with rustic rose gold, brass and chrome all featuring in contemporary bathrooms. The right tapware also adds authenticity to the bathroom decor: brushed chrome or gunmetal will suit contemporary styling, while burnished brass is an on-trend yet sympathetic choice for more traditional bathrooms. Tip: Generally speaking, bathroom renovations are expected to last at least 10 years, which is why timeless, neutral colour schemes tend to dominate. You can give a neutral bathroom the 2018 treatment by adding in colourful accessories that are easy to change, such as towels, decorative ceramics and flowers. Designers everywhere are embracing and celebrating the warmth and tactility of natural finishes. It’s a design trend that ties in with the current notion of wabi-sabi – the appreciation of imperfections within materials. John Spiteri, CEO and head designer at Brindabella, says the trend pivots around the use of reclaimed and recycled timber for vanities, bespoke seating or shelving. These materials add character and bring “softness into the bathroom with texture, colour and feel,” he says.